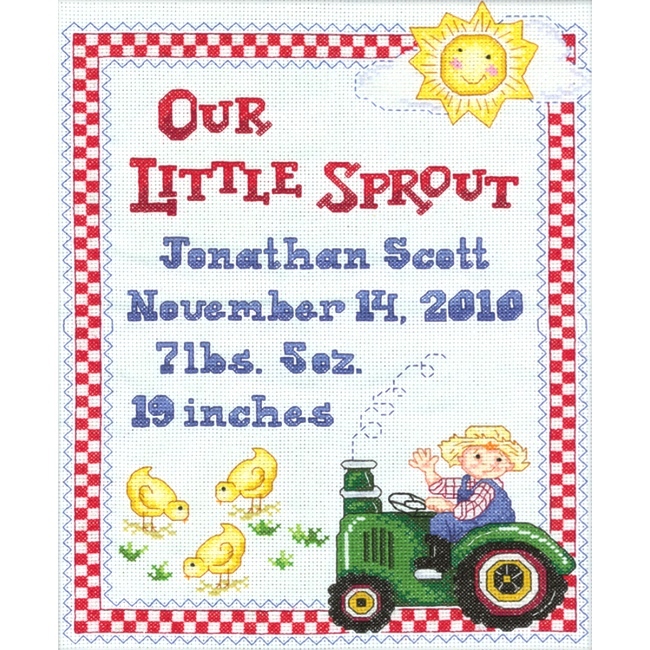 We've added a new selection of Cross Stitch Kits for Baby to the store. You won't want to miss these new farm-themed cross stitch patterns. You'll find them in the Embroidery Kits section! The classic children's song "Old McDonald Had a Farm, E-I-E-I-O!" comes to life in this fun On the Farm Baby Quilt Kit from Bucilla. 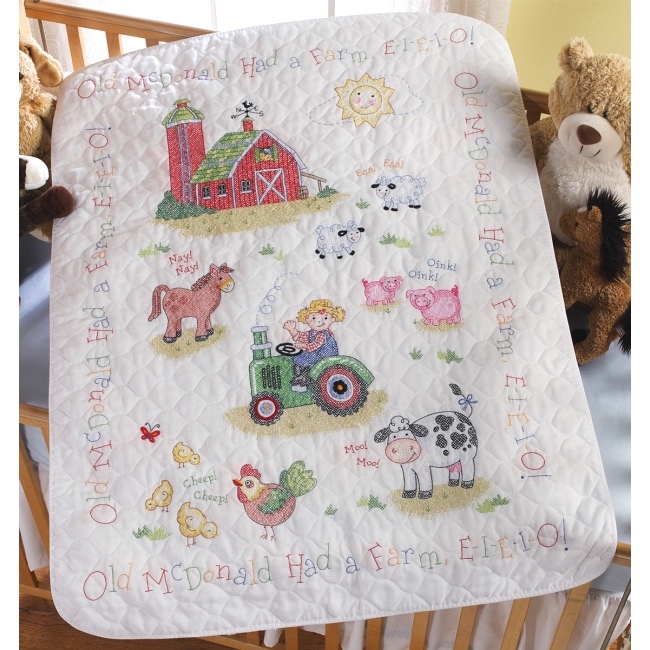 This stamped cross stitch baby quilt design features a complete farm scene, including red barn, lively farm animals, and a friendly farmer riding a green tractor. 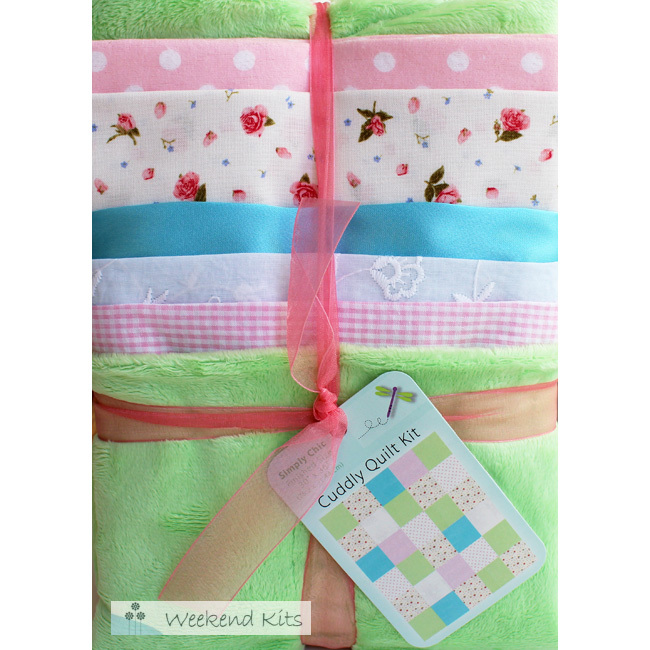 Kit includes a prefinished baby quilt, cotton embroidery floss, floss separator, needle, and instructions. The cross stitch pattern is stamped on the baby quilt in wash-away ink. With stamped cross stitch, there's no chart or counting required. Stitches are placed directly over the X's on the fabric. Your finished baby quilt will become a treasured family keepsake! The matching On the Farm Baby Birth Record Kit is a counted cross stitch design from Bucilla. 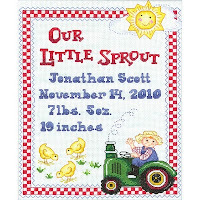 This counted cross stitch design highlights baby's birth record with a smiling sun, three baby chicks, and a farmer riding a green tractor. Kit includes 14-count white Aida fabric, cotton embroidery floss, floss separator, needle, chart and instructions. With counted cross stitch, the design is not printed on the fabric. Stitches are placed by following a chart and then counting squares along the woven fabric. Your completed birth announcement will look perfect displayed in baby's nursery! 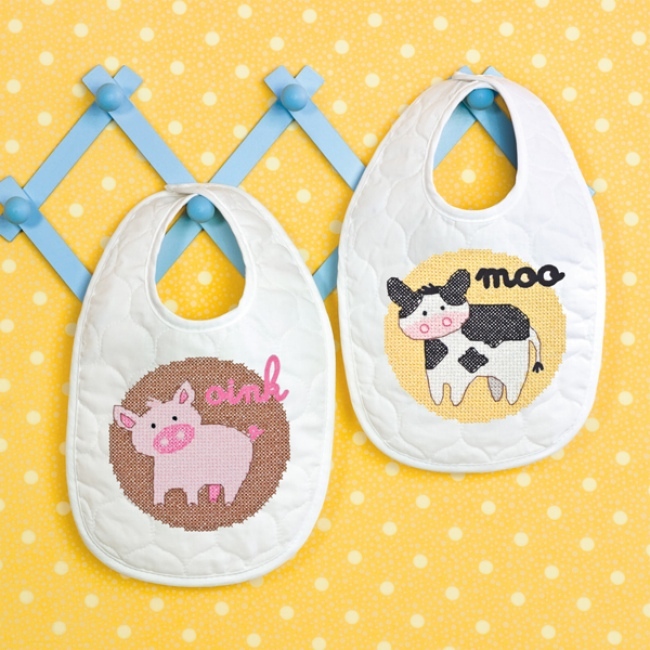 The Barn Babies Bibs Kit is a baby bibs stamped cross stitch kit from Dimensions, featuring farm animal designs of a baby pig & baby cow. Kit includes two ready-to-embroider quilted baby bibs, presorted cotton thread, needle, and instructions. The cross stitch patterns are pre-stamped on the bibs in wash-away ink. 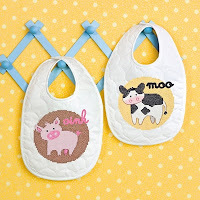 Baby bibs are an easy cross stitch kit for beginners to try. Other Embroidery Supplies you'll need to complete your cross stitch kit include an embroidery hoop for holding your fabric taut while stitching and embroidery scissors for snipping threads. An optional supply that I find useful is an embroidery needle threader. Visit the Embroidery Kits section of the store for details on these kits and to see our complete selection of embroidery kits for baby, including stamped cross stitch kits and counted cross stitch kits. Weekend Kits specializes in modern DIY Art & Craft Kits for adults, teens, and kids. We believe crafting should be convenient, easy, and FUN for all skill levels. Stop by today and be ready to cross stitch something new for baby on your next Weekend at Home. Jewelry Class in a Box! Giveaway Plus 2 Bonus Kits! The September Craft Kit Giveaway has ended - be sure to check back for future giveaways! The winner of the September Craft Kit Giveaway is Donna T. Congratulations Donna! Please Contact Us with your shipping information and we'll have your prize out to you right away. It's time for the September Craft Kit Giveaway at Weekend Kits. One winner will be randomly selected to win 3 Jewelry Making Kits! The main prize is from Cousin's Jewelry Class in a Box! collection of beginner jewelry kits. This kit has everything you need to make 2 necklaces, 2 bracelets, and 2 earring sets. Main Prize: Brights Glass Jewelry Class in a Box! Jewelry Class in a Box! Kits are perfect for beginners. They include a 3-in-1 jewelry making tool, assorted beads, findings, bead mat, and instructions for making the jewelry pieces shown on the cover. 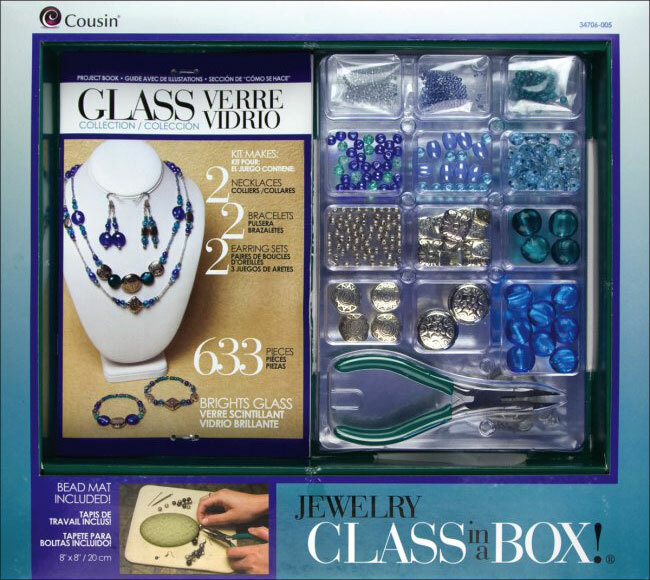 Visit the Jewelry Making Kits section of the store to see all 8 styles of Jewelry Class in a Box! 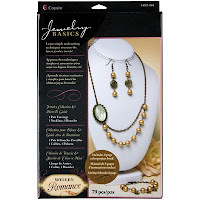 Kits and to see our complete selection of Jewelry Kits for beginners & experienced crafters. 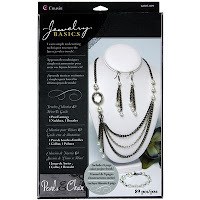 The winner will also receive these 2 bonus Jewelry Kits from Cousin's Jewelry Basics collection. 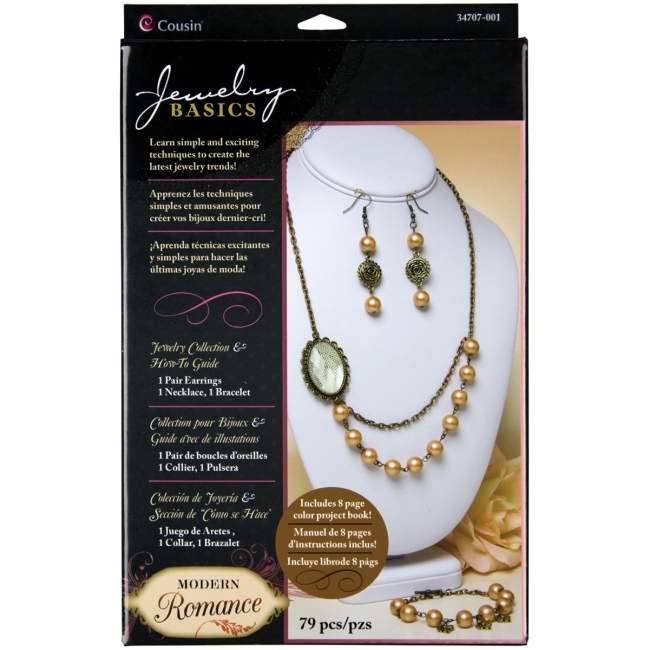 These kits include all the beads & findings you need to make a coordinated 3-piece jewelry set. 1) Just leave a comment here on this blog post before the end of the day Thursday, September 29, and you'll be entered to win! - You have until Thursday, September 29 at 12:00pm (EDT) to enter. The winner will be announced here on Friday, September 30. We don't collect email contact info at time of entry, so it's important to check back here to see if you won. It might be helpful to add a reminder to your calendar. Updates are always posted on our Facebook page, so if you've joined us there, you're set! Cutting the Fabric Pieces - You're Here! I created this Baby Quilt Kit Tutorial to help beginners work through the process of making one of these cuddly quilts for baby. The Cutting the Fabric Pieces post uses photos and written explanation to help beginners apply basic rotary cutting techniques to cutting the fabric pieces for their quilt. This tutorial is intended to be a supplement to the instructions provided with your kit. Be sure to read through all of the instructions before starting your baby quilt. Use the following outline to jump to a specific section of this post. 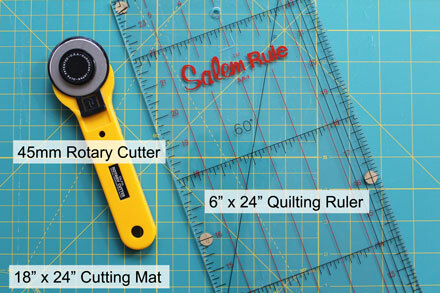 This tutorial assumes that you know how to safely use a rotary cutter. Always keep your rotary cutter in safe mode until you're ready to make a cut and always return it to safe mode whenever you put your cutter back down. When cutting, always be sure that your cutting path is completely clear prior to starting your cut. This is the basic set of rotary cutting tools you'll need for your baby quilt kit project. A 45 mm rotary cutter is a good standard size cutter to have and works well for this application. The blade is very sharp and I recommend making a habit of always closing the blade whenever you put the cutter down. You'll need a self healing cutting mat made specifically for use with rotary cutters. A cutting mat size of 18" x 24" or larger will work well for this quilt project. 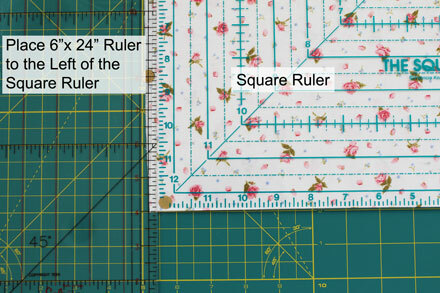 If you can have only one ruler, the standard 6" x 24" quilting ruler is the one you want. As you do more quilting, you'll find that it's really nice to have an assortment of quilting rulers so that you can choose the best ruler for the job. You'll find the instructions wrapped up inside the fabrics. Be sure to read all of the instructions before starting your baby quilt. A couple important reminders are to NOT prewash the fabrics and to be very careful when ironing the fabrics. The plush and satin fabrics are especially sensitive to heat. It's recommended to use a pressing cloth to protect the fabrics and iron from being damaged. The first step in the instructions provides a detailed chart of Fabrics and Cutting Sizes. This chart will tell you the quantities & sizes of the pieces you need to cut from each of the fabrics. This is the point in the project I always like to remind myself of the familiar woodworking saying "measure twice, cut once". Like wood, fabric can't be un-cut, so it's really important to take your time here. That being said, if you do make a mistake in cutting, take heart, there's usually a creative solution you can find to patch things up! 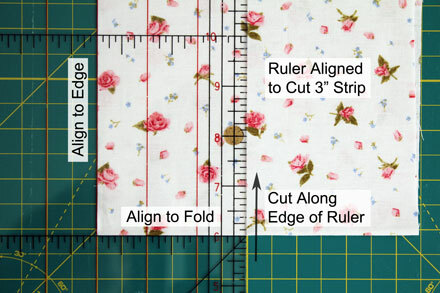 The following sections show basic rotary cutting techniques for laying out the fabric pieces, squaring up the leading edge, and cutting your strips & blocks. It's important to look at the overall dimensions of each fabric piece and have a layout plan that ensures adequate yardage prior to cutting the fabric. 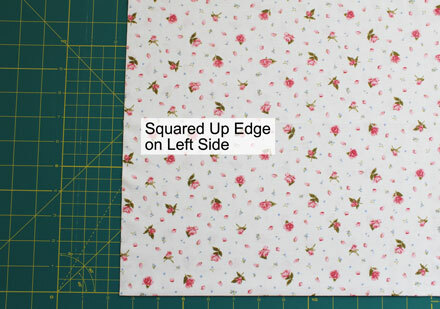 For some fabric pieces, your Cuddly Quilt Kit instructions may show an alternate layout to make best use of the fabric. Always follow the layout shown in the instructions to ensure adequate yardage. Fabric strips are generally cut from selvage to selvage across the crosswise grain of the fabric. 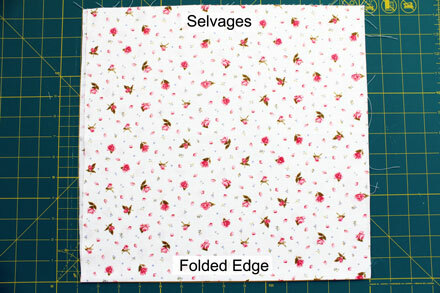 Fold fabric pieces in the middle so that the selvages meet together and are aligned at the top of the cutting mat. Shift the selvages left and right until the fabric lies flat without wrinkles. It's OK for now if the cut edge on the left or right is uneven, you'll take care of this in the next step. Lay out the fabric pieces so that the fold is towards you. For rotary cutting, right handers will start cutting at the left edge of the fabric and move to the right. If you're left handed, you'll move from right to left. The photos are labeled for right handers. Left handers will need to reverse directions, changing out left for right and vice versa. The first cut you'll make is to square up the leading edge. This ensures the edges are even and that they're at a 90 degree angle to the fold. Only cut the very minimum amount of fabric necessary to get a clean cut. If you find that the leading edge is already squared up, then you can skip this step altogether. There are a couple ways to square up your fabric and I'm going to show you both. The first one requires one additional quilting ruler, while the second approach can be done using just your 6" x 24" quilting ruler. 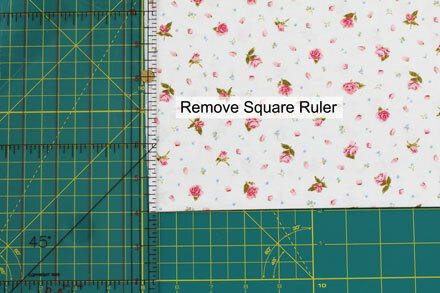 You'll need one additional square quilting ruler for this option. 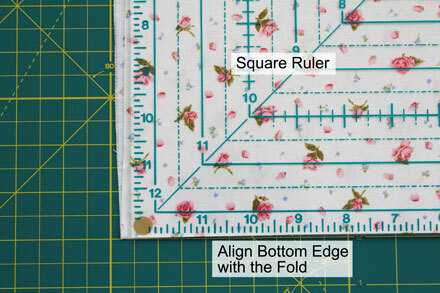 Step 1) Align the bottom edge of a square quilting ruler with the folded edge of the fabric. Step 2) Place your 6" x 24" quilting ruler to the left of the square ruler, making sure it's right up against the edge and that the square ruler is still aligned with the fold. Step 3) Carefully remove the square ruler. Step 4) Use your rotary cutter to square up the leading edge. Step 5) Remove excess fabric & you're ready to start cutting strips. 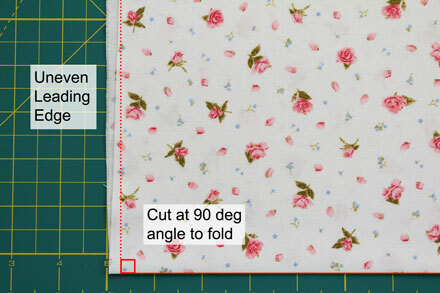 You only need your 6" x 24" quilting ruler for this option. Step 1) Flip the fabric piece over so that the leading edge is now on the right. Place your 6" x 24" ruler on the fabric, aligning the markings on the ruler with the folded edge. Step 2) Use your rotary cutter to square up leading edge. Cut the minimum amount of fabric needed to get a clean cut. Step 3) Remove excess fabric & flip your fabric back over so that the squared up leading edge is on the left again. 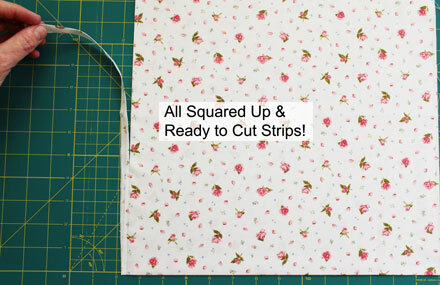 Once the leading edge is squared up, you're ready to cut strips. 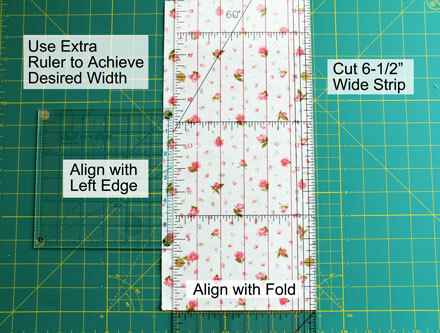 Always follow the Fabric & Cutting Sizes chart in your instructions to determine the appropriate strip widths & lengths you need to cut for your particular Cuddly Quilt Kit design. 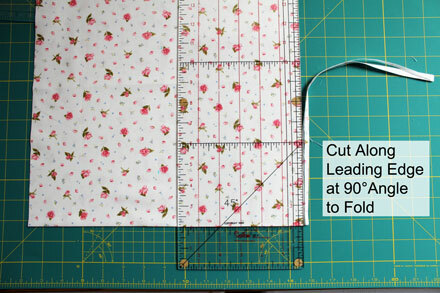 Be sure to follow the alternate layout provided in your Cuddly Quilt Kit instructions when cutting your backing fabric. If you need a strip that is less than or equal to 6" wide, simply align your 6" x 24" quilting ruler to the desired width from the edge. The ruler should line up evenly with both the edge and fold. In this example, I'm setting up to cut a 3" strip. There are a couple ways to cut strips that are greater than 6" wide and I'm going to discuss both. The first one requires one additional quilting ruler, while the second approach can be done using just your 6" x 24" quilting ruler and a water soluble pen. 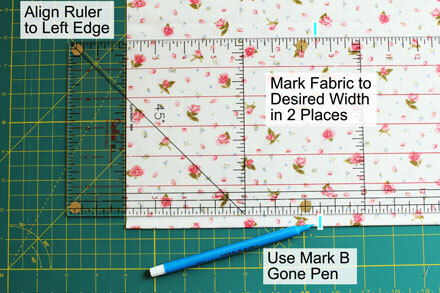 You'll need your 6" x 24" ruler and one additional quilting ruler for this option. Place the extra ruler on the left edge of the fabric, adjusting placement to achieve the extra width you need beyond 6 inches. 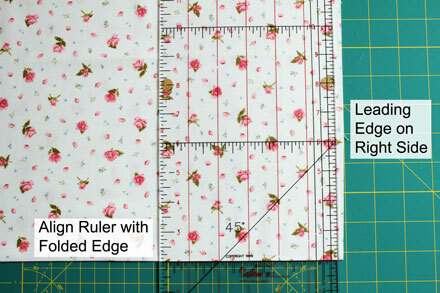 Be sure that both rulers are aligned evenly to the edges of the fabric. In this example, I needed a 6-1/2" strip, so I'm using my second ruler to add an extra 1/2" to my 6" wide ruler. Use your rotary cutter to cut along the right edge of the ruler. Step 1) You'll need your 6" x 24" ruler and a water soluble marking pen, such as Mark B Gone, for this option. 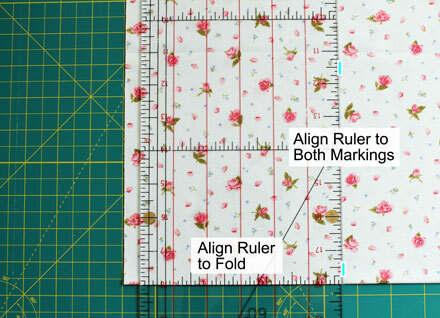 Align the ruler to the left edge and mark the fabric to the desired width in at least two places. Step 2) Align your 6" x 24" ruler to the fold and both markings. 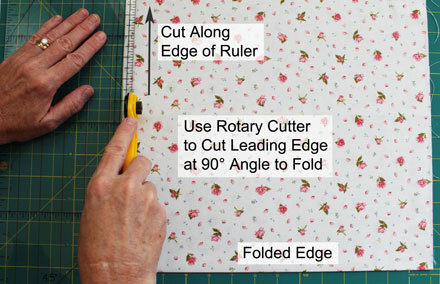 Use your rotary cutter to cut along the right edge of ruler. Once you have your strips cut, you're ready to cut individual blocks. Cutting blocks uses all the same rotary cutting techniques discussed above. First, unfold strip and lay out horizontally on cutting mat. Then, square up leading edge if needed and cut your blocks to the desired lengths. 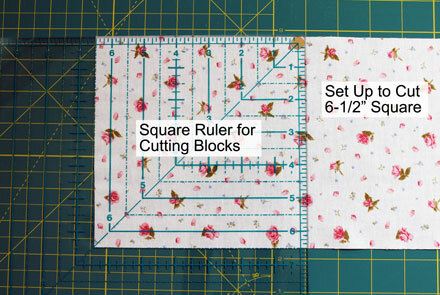 I want to show you how useful a square quilting ruler is for cutting blocks. 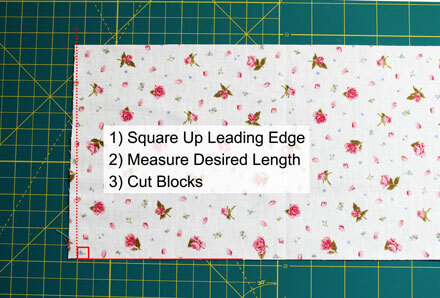 The size of the square ruler you'll need depends on the size of the blocks you need to cut for your quilt. In the following photo, I'm using a 12-1/2" square ruler to cut a 6-1/2" square block. Continue to work through each of your fabric pieces until you have all your blocks completed. Here are my blocks - ready for piecing! Once you have all your blocks cut, you'll be ready to move on to the next post in the Baby Quilt Kit Tutorial - Machine Piecing the Quilt Top! 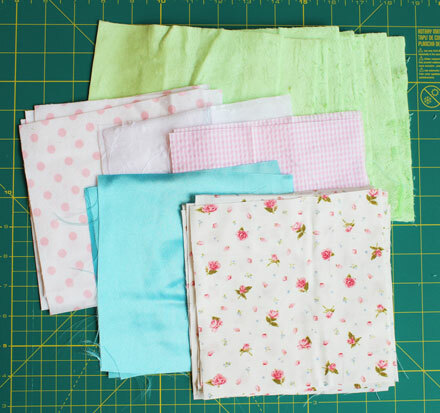 We have a new selection of Learn to Sew Kits for kids to learn basic sewing skills. These easy sew crafts are safe, fun, and affordable. They're a great choice for teaching kids & grandkids how to sew. You'll find them in the Kid's Craft Kits section! 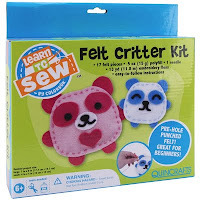 The Panda Felt Critter Kit from Colorbok is an easy sewing project for kids to make 2 felt panda toys. Kit includes felt pieces, stuffing, plastic needle, embroidery thread, and easy to follow instructions. 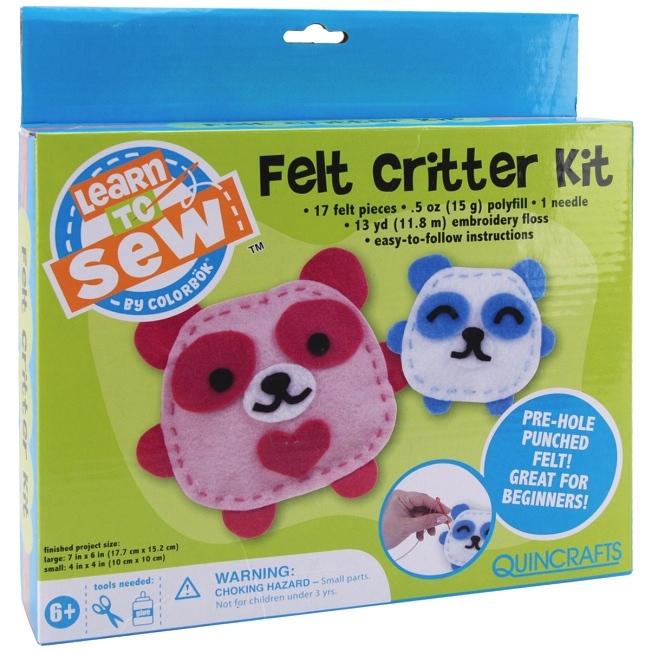 This is an ideal sewing starter kit for kids ages 6 & up to learn how to sew. The child-safe plastic needle will put your mind at ease when teaching younger children. 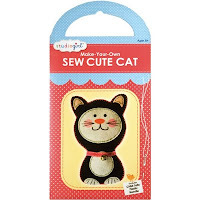 The Sew Cute Cat Kit from Grant Studios is an easy sewing craft kit for kids to make a felt cat toy. Kit includes felt pieces, stuffing, plastic needle, thread, ribbon, bell, and easy to follow instructions. The felt pieces are prepunched with small stitch holes for easy hand sewing and assembly. Perfect for young beginners ages 8 & up. Visit the Kid's Craft Kits section for details on these kits and to see our complete selection of kits for kids to learn a variety of crafting skills, including sewing, knitting, embroidery, jewelry making, and more. Kits are a convenient option for busy parents looking for ready-to-create craft project ideas for the family. Weekend Kits specializes in Art & Craft Kits for adults, teens, and kids. Stop by today and be ready to craft with the kids on your next Weekend at Home. 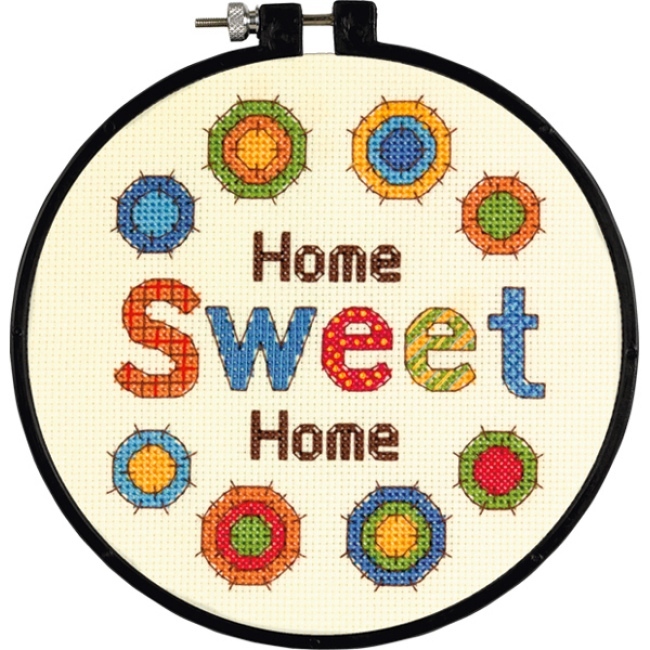 If you're looking for some modern DIY home decor ideas, you won't want to miss our newest selection of counted cross stitch kits from Dimensions. We're adding a variety of creative needlework projects to cover a range of skill levels, from Learn-A-Craft Kits for beginners to Gold Collection Kits for experienced cross stitchers. You'll find them in the Counted Cross Stitch Kits section of the store! 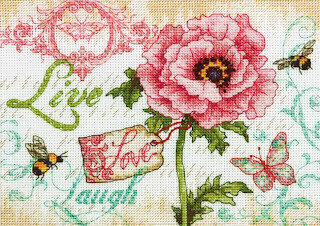 The Live, Love, Laugh Counted Cross Stitch Kit features a lovely vintage rose inspired cross stitch design. 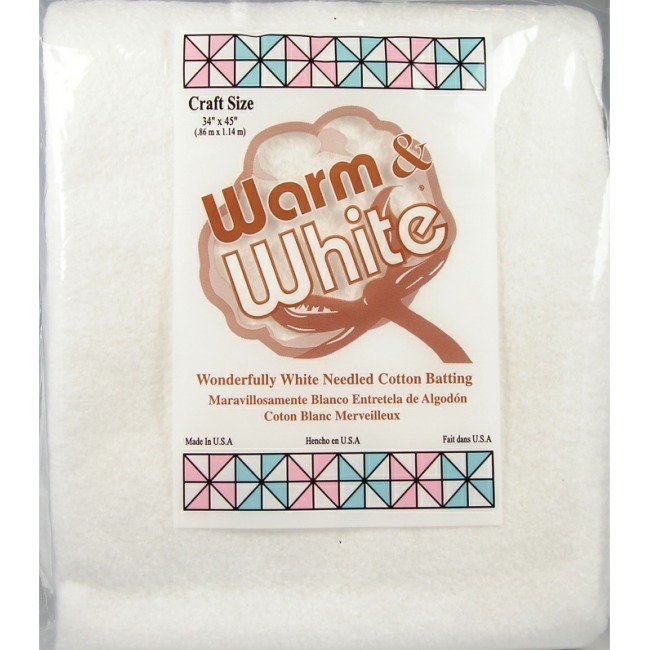 Kit includes 18-count white cotton Aida, presorted cotton thread, needle, chart and instructions. 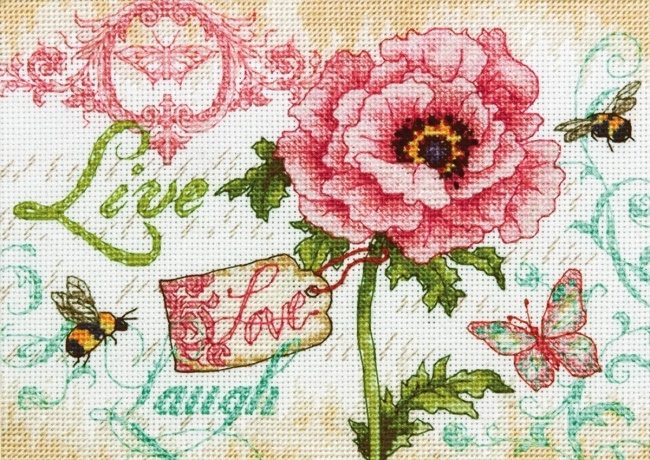 Live, Love, Laugh is a modern cross stitch design with romantic appeal. Perfect for creating a beautiful anniversary or wedding keepsake to celebrate your special day or for handmade gift giving. Note to beginners: Aida cloth refers to the cotton mesh fabric used for counted cross stitch. The mesh forms small square openings in the fabric. The count refers to the number of cross stitch squares per inch of fabric. As the count number increases, the individual cross stitches get smaller. While this increases the resolution or detail of the cross stitch design, it also increases the difficulty. Kits with 18-count Aida fabric are recommended for experienced cross stitchers, while kits with 14-count Aida or lower are a good choice for beginners just getting started in counted cross stitch. 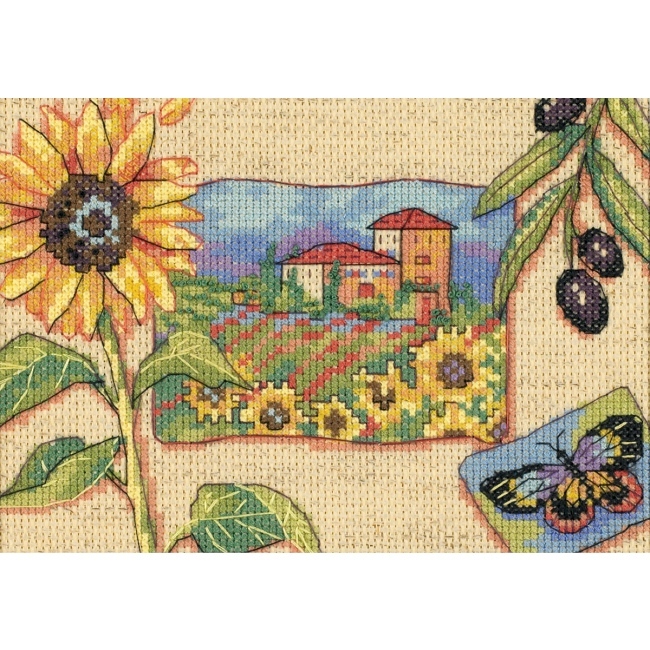 The Tuscan Sunflower Counted Cross Stitch Kit features a sunny Italian villa cross stitch design. 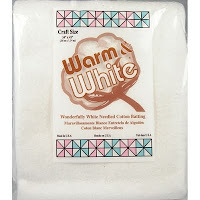 Kit includes 14-count natural cotton Aida, presorted cotton thread, needle, chart and instructions. Display your finished needle art in a favorite family gathering area in your home or give as a creative housewarming gift for a friend! Note to beginners: In counted cross stitch, the design is not printed on the foundation fabric as it is with stamped cross stitch. The Aida cloth used for counted cross stitch is a blank mesh fabric. Stitch placement is accomplished by translating a printed chart to the Aida fabric. Stitchers read the chart and then count the squares in the fabric to determine the correct location for each stitch. Symbols are used on the chart to indicate thread color. 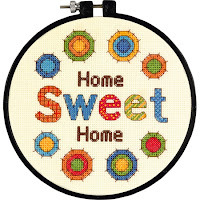 The Sweet Home Learn-A-Craft Kit is an ideal embroidery starter kit for learning counted cross stitch. Kit includes a 6-inch embroidery hoop, 14-count ivory cotton Aida, presorted cotton thread, needle, chart and instructions. I love the Learn-A-Craft series of embroidery kits because they offer an affordable, low risk option for beginners to give a craft a try. 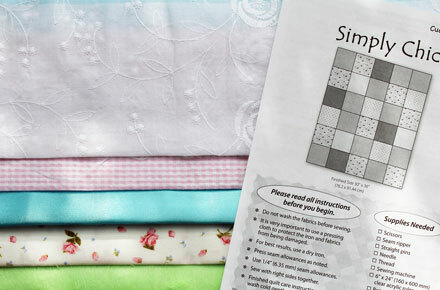 They provide everything a beginner needs to get started cross stitching. And, when your needlework is finished, the hoop can be used as a creative frame for easy display. Visit the Counted Cross Stitch Kits section for details on these kits and to see our complete selection of cross stitch kits for beginners and experienced stitchers. This is a growing section of the store, so be sure to check back now and then for new product arrivals. Weekend Kits offers a unique collection of Art & Craft Kits for adults, teens, and kids. You'll find the very best selection of kits from well known brands as well as independent artists. Stop by today and be ready to create handmade needle art on your next Weekend at Home! Thanks for visiting the Weekend Kits blog.